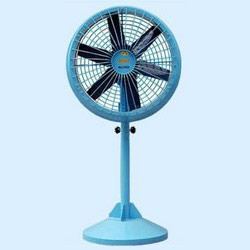 Windy” pedestal man cooler fans are mainly used in hot areas of the industry or work unit. they are basically used as man cooler. it comes with sturdy shell housing & both sides protected grills, with inlet cone for better entry for air, with aluminum impeller dynamically balance, incorporate with manually oscillating arrangement. they are available in different sizes and models. Established in the year 1991,we are considered as one of the cardinal manufacturers and suppliers of a distinguished assortment of Rubber Coatings, Fans and Other Industrial Supplies. This product range comprises Rubber Coatings, Safety Hand Gloves, Dust Collectors, Industrial Fans and Roof Ventilator Fans. These products are meticulously manufactured by our professionals using premium quality raw material and components. This array of products is lauded by the clients for its resistance to heat & chemicals, hassle-free operations, compact design, high strength and robust construction. Apart from this, we have also emerged in trading a comprehensive gamut of Packaging Material, which includes PP Bags, Packing Clips and PP Fabrics. These products are sourced from the renowned and certified vendors of the market. Our products are widely acclaimed for their fine finish, attractive design and lightweight. Owing to the effective usage, durability, cost-effectiveness and other considerable features of our offered range, it is extensively used for numerous applications in different industries and sectors. To meet the diversified requirements of the customers, we provide these products in customized forms as per their laid down specifications. All the products provided by us are rigorously examined by our dexterous team of quality inspectors for assuring its accordance with international standards of quality. Moreover, we make sure that all the products are properly packed and then delivered at the clients' end within the stipulated time frame.